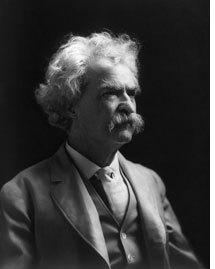 You may know Mark Twain for some of his very popular books like Adventures of Huckleberry Finn and The Adventures of Tom Sawyer. He was a writer and also a humorist, satirist and lecturer. If you don't approve of yourself, of your behavior and actions then you'll probably walk around most of the day with a sort of uncomfortable feeling. If you, on the other hand, approve of yourself then you tend to become relaxed and gain inner freedom to do more of what you really want. This can, in a related way, be a big obstacle in personal growth. You may have all the right tools to grow in some way but you feel an inner resistance. You can't get there. What you may be bumping into there are success barriers. You are putting up barriers in your own mind of what you may or may not deserve. Or barriers that tell you what you are capable of. They might tell you that you aren't really that kind of person that could this thing that you're attempting. So you need give yourself approval and allow yourself to be who you want to be. Not look for the approval from others. But from yourself. To dissolve that inner barrier or let go of that self-sabotaging tendency. This is no easy task and it can take time. So many limitations are mostly in our minds. We may for instance think that people will disapprove because we are too tall, too old or balding. But these things mostly matter when you think they matter. Because you become self-conscious and worried about what people may think. And people pick up on that and may react in negative ways. Or you may interpret anything they do as a negative reaction because you are so fearful of a bad reaction and so focused inward on yourself. If you, on the other hand, don't mind then people tend to not mind that much either. And if you don't mind then you won't let that part of yourself become a self-imposed roadblock in your life. And a lighter mood is often a better space to work in because now your body and mind isn't filled to the brim with negative emotions. When you are more lighthearted and relaxed then the solution to a situation is often easier to both come up with and implement. Anger is most of the time pretty pointless. It can cause situations to get out of hand. And from a selfish perspective it often more hurtful for the one being angry then the person s/he's angry at. So even if you feel angry at someone for days recognize that you are mostly just hurting yourself. The other person may not even be aware that you are angry at him or her. So either talking to the person and resolving the conflict or letting go of anger as quickly as possible are pretty good tips to make your life more pleasurable. This belief can cause a lot of anger and frustration in your life. Because the world may not give you what expect it to. On the other hand, this can be liberating too. You realize that it is up to you to shape your own life and for you to work towards what you want. You are not a kid anymore, waiting for your parents or the world to give you something. You are in the driver's seat now. And you can go pretty much wherever you want. 6. If you're taking a different path, prepare for reactions. I think this has quite a bit of relevance to self-improvement (and also to starting a business online now that I think about it). If you start to change or do something different than you usually do then people may react in different ways. Some may be happy for you. Some may be indifferent. Some may be puzzled or react in negative and discouraging ways. Much of these reactions are probably not so much about you but about the person who said it and his/her life. How they feel about themselves is coming through in the words they use and judgement they make. And that's OK. I think it's pretty likely that they won't react as negatively as you may imagine. Or they will probably at least go back to focusing on their own challenges pretty soon. You may find that when you finally cross that inner threshold you created then people around you may not shun you or go chasing after you with pitchforks. :) They might just go: “OK”. What you focus your mind on greatly determines how things play out. You can focus on your problems and dwell in suffering and a victim mentality. Or you can focus on the positive in situation, what you can learn from that situation or just focus your mind on something entirely else. It may be “normal” to dwell on problems and swim around in a sea of negativity. But that is a choice. And a thought habit. You may reflexively start to dwell on problems instead of refocusing your mind on something more useful. But you can also start to build a habit of learning to gain more and more control of where you put your focus. 8. Don't focus so much on making yourself feel good. This is a great way to look at things to create an upward spiral of positivity and exchange of value between people. You help someone and both of you feel good. The person you helped feels inclined to give you a hand later on since people tend to want to reciprocate. And so the both of you are feeling good and helping each other. Those positive feelings are contagious to other people and so you may end up making them feel good too. And the help you received from your friend may inspire you to go and help another friend. And so the upward spiral grows and continues. Awesome quote. And I really don't have much to add to that one. Well, maybe to write it down and keep it as a daily reminder – on your fridge or bathroom door – of what you can actually do with your life.